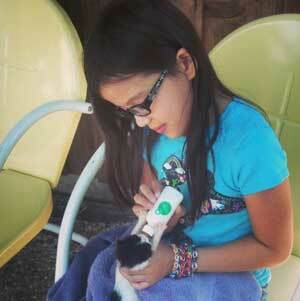 Jamie's Animal Rescue - Foster and Help Save a Life! IF YOU CAN'T FOSTER, PLEASE VOLUNTEER! THANK YOU FOR HELPING A PET IN NEED! It can't be said better than that.. Our intake is limited due to limited space. But with YOUR help, one more life can be granted a happy ending. Fostering a rescued pet is a very rewarding experience! When we take in a new dog or cat, they are taken immediately to the vet for any medical treatment necessary. Once healthy enough to leave the clinic, they need a kind and loving foster home while we search for the perfect forever home. The foster home provides lots of TLC and good food and treats for their foster pet. They also help teach proper manners, such as house-training, crate-training, etc. We provide all the necessities; crate, food, leash/collar/tag, treats, bones, bowls, toys, and all the vetting. All we ask of you is to provide a safe place for the animal to wait until his/her forever home has been chosen. If interested in helping a pet in need by being a foster parent, please complete the Puppy Foster Application or Kitten Foster Application and return to us in person or by email. We will then contact you to discuss which baby might be right for you and your family to foster.